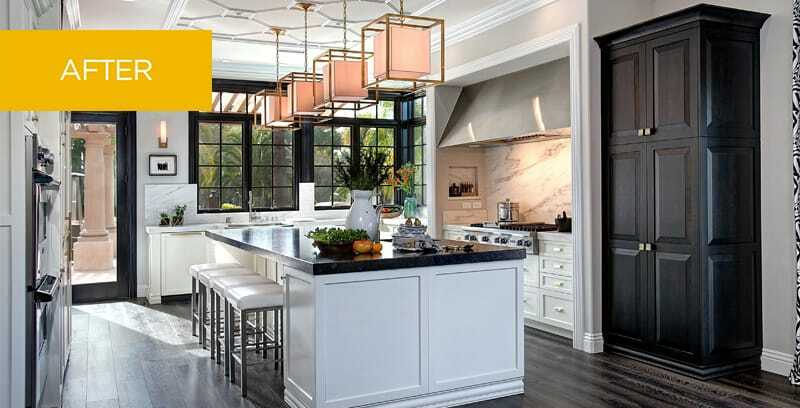 For a couple with two children who value art and family, love to cook large Italian meals, and frequently entertain, the kitchen in their Rancho Santa Fe home was limited in its functionality and style. 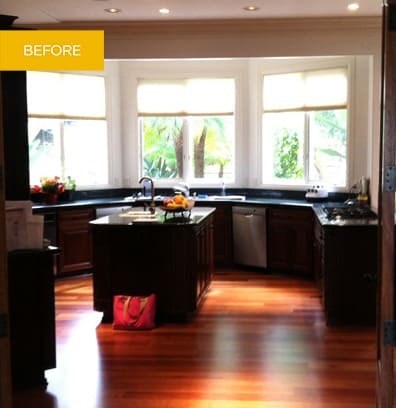 The clients wanted a far less isolated kitchen with much more natural light. They hoped for a space both elegant and welcoming, in keeping with their artistic, yet relaxed and unpretentious lifestyles. The primary architectural design decision was to relocate the kitchen to maximize the appreciation of the amazing natural vista and define the kitchen as a central gathering space. The new island is the centerpiece in a room that balances perfect form with structured rhythm. The graceful molding detail on the ceiling frames the island and brings human scale to the space. A precise row of geometric pendants in an antique brass finish illuminates with comforting order and warmth. Four white leather stools allow for conversation while cooking. Six foot high windows and French doors in striking black allow abundant natural light to flow through the new openness of the space. A palette of white and ebony with glimmers of antique brass establishes a classic mood balanced by the contemporary attitude of stainless steel. The breakfast area is now one of the family’s favorite places to spend time, surrounded by beautiful, expansive views.